The Alexander C. Humphreys residence designed by C.P.H Gilbert c. 1899 in Glen Cove. Click HERE for more on the Humphreys residence and HERE for more on 'Winfield Hall' which was built by Frank W. Woolworth c. 1916 after the Humphreys house burned down. 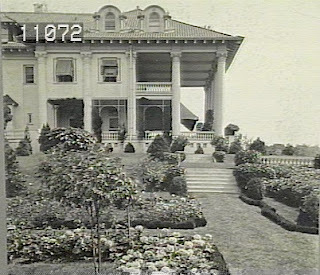 Photo from the Smithsonian's Archives of American Gardens. So very pretty with spacious verandas, window shades and fragrant gardens close to the house in the era before we all became accustomed to sterile enclosed environments.